도시계획이란 도시의 장래를 계획하는 일련의 활동이라 할 수 있지만 여기서의 도시계획은 토지 및 건축물의 용도, 높이, 밀도 등을 법률에 의해 통제하는 지역지구제를 나타내었다. 서울의 용도지역 지정현황을 살펴보면 약 48.4%가 주거지역으로 가장 넓은 면적을 차지하며, 그 다음이 녹지지역 41.8%, 준공업지역 4.8%, 상업지역 3.8%의 순이다. 용도지구는 용도지역의 기능을 보완하기 위해 개별목적을 가지고 지정되는 것으로서 고도지구, 공항지구, 미관지구, 풍치지구, 아파트지구의 순으로 넓게 지정되어 있다. 이러한 용도지역이나 지구계획보다 상세한 계획으로서 기존의 도시설계제도와 상세계획제도를 통합한 지구단위계획을 수립시행중에 있으며, 이는 기존 시가지 정비를 목표로 필지단위까지 정비방향이 정해지는 계획이다. Different from the original meaning of city planning, here city planning refers to a zoning system that restricts the developments of land, such as building designs, height, and density by law. The designated zoning of Seoul shows that residential areas constitutes 48.4%, the biggest portion of the total which is followed by a green area 41.8%, industrial area 4.8%, and commercial area 3.8%. Zoning district is a system, which designates certain districts to specific purposes such as height limit districts, airport districts, green belt, and apartment complex districts. In terms of land size, the areas subject to districts are in the above-mentioned orders. 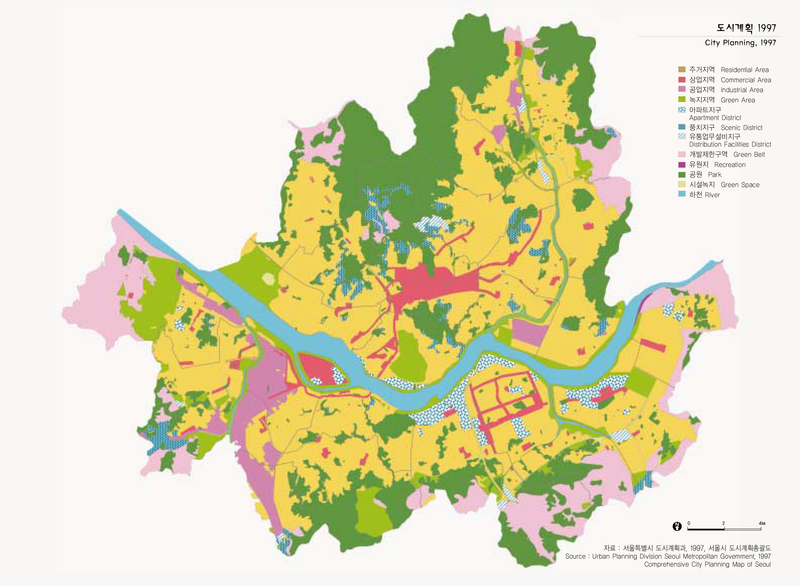 Seoul is working on 'District Plans’, which combines the existing urban design areas and detailed planning areas. Through the distict plans the city is an attempt to rearrange the roads and streets and guide the construction of buildings not only height but also color of the buildings etc. in detail.